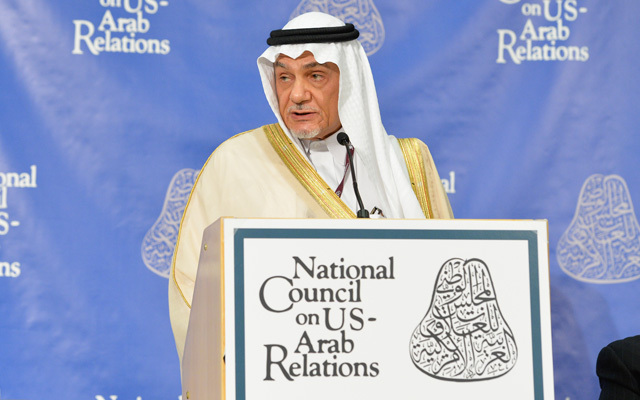 Keynote Address by HRH Prince Turki Al Faisal delivered at the National Council on U.S.-Arab Relations’ 24th Annual Arab-US Policymakers’ Conference, “U.S.-Arab Relations at a Crossroads: What Paths Forward?,” on October 14, 2015, in Washington, DC. The National Council on U.S.-Arab Relations’ 23rd Annual Arab U.S.-Policymakers Conference included a keynote speech from HRH Prince Turki Al Faisal. HRH Prince Turki Al Faisal – Chairman, King Faisal Center for Research and Islamic Studies, Riyadh, Saudi Arabia; former Saudi Arabian Ambassador to the United Kingdom and to the United States of America; former Director General, General Intelligence Directorate, Kingdom of Saudi Arabia. HRH Prince Turki Al-Faisal Al Sa’ud – Chairman, King Faisal Center for Research and Islamic Studies, Riyadh, Saudi Arabia; former Saudi Arabian Ambassador to the United Kingdom and to the United States of America; former Director General, General Intelligence Directorate, Kingdom of Saudi Arabia. Speaker: HRH Prince Turki Al Faisal Al Sa’ud –Chairman, King Faisal Foundation, Riyadh, Saudi Arabia; former Saudi Arabian Ambassador to the Court of St. James and to the United States of America; former Director General, Intelligence Directorate General, Kingdom of Saudi Arabia. Keynote Speaker: “A Vision for the Future of U.S. Saudi Relations” — HRH Prince Turki Al Faisal, Ambassador of Saudi Arabia to the United States of America; Chairman, King Faisal Center for Research and Islamic Studies in Riyadh; Co-Chair, C100 Group, Council of 100 Leaders (West-Islamic World Dialogue) which has been affiliated with the World Economic Forum since 2003; Founding Member, Board of Directors, King Faisal Foundation; former Ambassador of Saudi Arabia to the United Kingdom and Ireland; and former Director General, General Intelligence Directorate, the kingdom’s main foreign intelligence service, 1977-2001.